Do You Remember the 70s, 80s and 90s? : Tickle-on-the-Tum! When people say "ah, you see, you couldn't make a programme like that now-a-days" they might have "tickle-on-the-tum" in mind. First aired in 1983 (continuing until 1988) it was set in the fictional village of... tickle-on-the-tum. They were 10 minute episodes, and every week a new village resident would enter the local shop and recount a tale from the past week - the tale would then be made into a folksy song! How quaint, and how much of a lost and by-gone world! 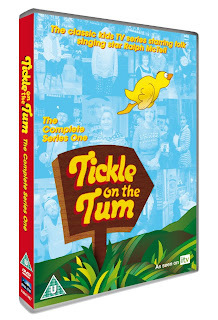 Even the title alone "Tickle-on-the-Tum" harks to a time of innocence and non-complicated viewing that in today's cynical and world weary 2010's would be impossible to air. Tickle-on-the-tum?! These days with a fear-mongering media, that title almost seems totally inappropriate for a childs programme. If you look into the cast of this show you can see how the programme got away with it's folksy ways, it's almost a who's who of 1980's uncle and aunt figures, the type of celebrity that made you go "ahhhhh" and cosy up into the croched doilies on the back of your floral settee. There was Bill Oddie, Penelope Keith, John Wells, Molly Sugden, Nerys Hughes, even the folk singer Ralph McTell. It makes fascinating viewing, because even though it's dated and old, it really is quite enchanting. You will find yourself enjoying the stories and story telling, the performances and the pace of the series. You might even find your eyes misting over with thoughts of an England past, a nostalgic reverie, when all was happy, the birds tweeted rather than the teenagers, and people spoke rather than facebooked each other. Though do remember during that reverie that this was also the time of late punk, huge unemployment, the miners strike and massive social upheaval. So it wasn't all ideal.